So it's been a while since I've done a restaurant review but I managed to climb over the mountain of smartfood bags and empty monster cans out of my cave and into society to enjoy a lovely meal. I went to The Blue Fish years ago (pre blog era) and enjoyed the goat cheese salad so I was looking forward to my long overdue return. Blue Fish is a classy joint, focusing mostly on fresh seafood dishes (gee, ya don't say) their menu ranges anywhere from a simple soup and salad combo to a full out dinner portioned entree. It was a cold and windy day so we both started out with a cup of soup. I ordered the seafood gumbo (pictured below) which was a cajun spiced roux with hearty lumps of shrimp, crab, scallops, crawfish, and white fish, basically it's the ultimate seafood soup. I was blown away from the flavor and the warmth that came from the cajun spices. There was a good meat-to-broth ratio and all the seafood was fall apart tender. 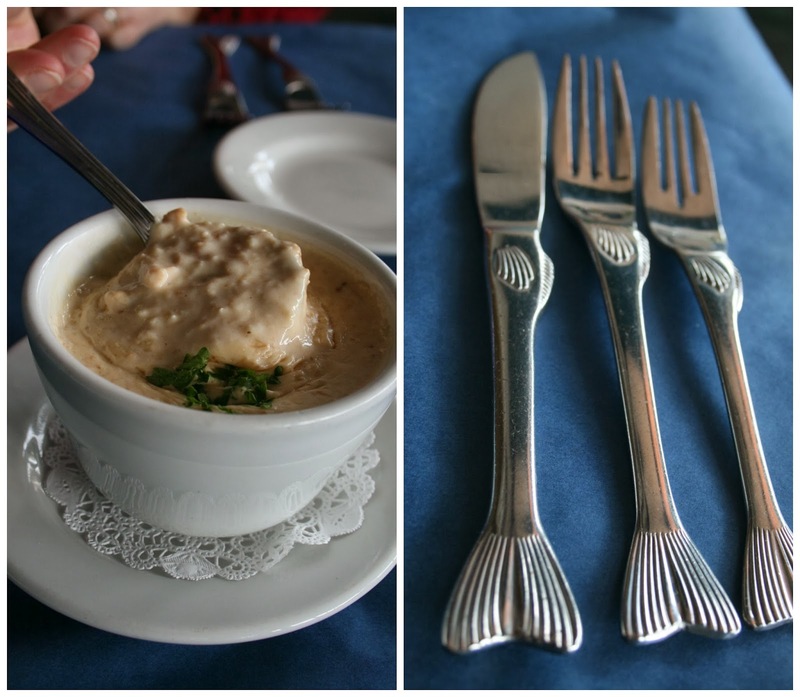 The other soup we tried was the crab bisque which is a cream based soup with a touch of sherry and loads of crab! It was everything you'd expect from this comforting classic, rich and creamy in texture with chunks of sweet crab meat, I personally could have had a bit more sherry to cut the grease but it was still very tasty. When it came to choosing an entree, my eyes were immediately drawn to "scallop mac and cheese" never has any phrase sounded so ungodly delicious to me. Imagine a wonderfully decadent cheesy mountain of noodles topped with perfectly seared sea scallops and grilled asparagus (because something has to be healthy). I am not gonna lie, that first bite of scallop and noodle sent me straight into a full on foodgasim, yes I said it! It was SO good. Coming from experience it is difficult to cook scallops, especially one of that size, but this one was spot on. My only complaint about the meal was that the shrimp, while they were cooked to perfection had a very strong freezer after taste which I have unfortunately been experiencing a lot lately. If I had known this, I definitely would have opted for the all scallop option and skipped the shrimp. We also tried the Horseradish crusted catch which was pan searched with scallion oil and served with garlic smashed potatoes and squash medley with your choice of either trigger, Mahi, or Salmon (I choose the triggerfish). The horseradish added a unique element of flavor and the fish was moist and flaky (having never eaten triggerfish before I was super pleased). The potatoes were creamy and flavorful and the squash and zucchini medley was good as well. 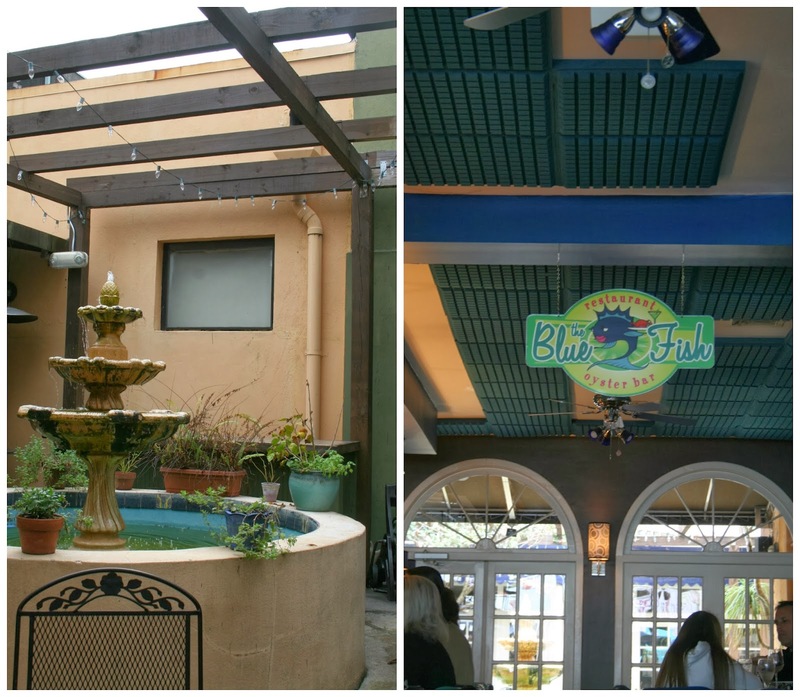 After all these years I am so glad I finally made a return visit to The Blue Fish.It's cool blue atmosphere and various menu items make it easy to accommodate any preference or price range. These people truly know how to cook fresh and flavorful seafood.